Securit Tank Guard is now available. 4 years ago Securit Gb Ltd developed and manufactured the product to secure fuel theft. With the increase of fuel and the harsh weather, oil theft is on the increase. 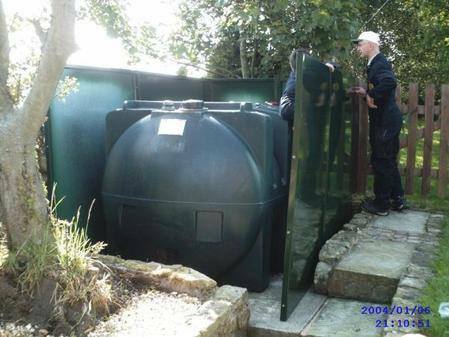 Securit Tank Guards are designed to fit around the existing oil tank (and plinth).The enclosure is approx 200mm larger than the oil tank on all sides which enables ventilation around the tank. The steel panels are secured to the floor/concrete base of the oil tank plinth (if the tank is sited on a hard standing surface). Securit Tank Guard are designed to enclose majority of tank’s including tanks with Oil Watchman’s. The gallery photos show a selection of designs which Securit Gb Ltd have designed, manufactured and installed. Securit Tank Guards can be placed onto concerte plinths using canti lever brackets for support. 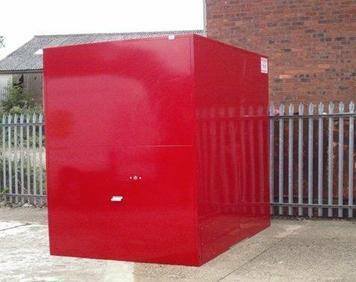 Securit GB Ltd team will design the Tank Guard to your requirements.We offer nationwide delivery and installation. Manufactured in 1.2mm galvanised steel with 10 years non flaking guarantee. Galvanised steel is applied to fabricated iron and steel products by hot dip galvanising in accordance with EN ISO 1461. Galvanised steel is a layered metal substrate where a zinc layer is bonded to the steel through either hot dipping or electro coating. Hot dipping or galvanising and electro coating or electro plating are used to protect steel from corrosion in the construction manufacturing industries. The Tank Guard is manufactured from galvanised steel sheets and then coated in Polyester powder coating. Polyester has very good edge covering, flow properties, wear resistance in addition to gloss retention in outdoor exposure.The finished coating is available in a huge range of colours and finishes and provides a great decorative finish to any product. The chemical resistance in acid environments is good, less so in alkaline environments. Polyester coatings feature hard, abrasion-resistant properties which make them ideal for such applications as architectural metalwork, shop fittings, garden and leisure equipment, handrails, roller shutter doors and sheet metalwork - 60-100 microns is typical. 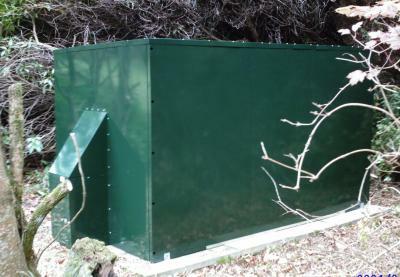 To ensure the enclosure is strong and ridge the galvanised sheets are manufactured with double returned panels with the roof constructed in sections for additional strength. Securit Tank Guards are supplied with all the fixtures and fittings. The majority of the panels are bolted internally, but the few external bolts are fitted with internal nylock nuts to prevent exposed bolts being removed. All exposed fixing are bright zinc plated with all hinges stainless steel. Two shackless padlocks are supplied with the Tank Guard structure. 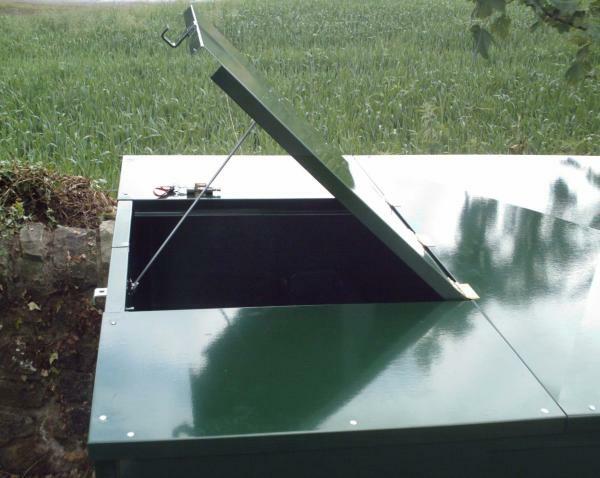 The Tank Guard is designed to allow access, if required, to the oil tank for maintenance.A large, secure, access panel is fitted over the oil filler for easy refilling with a smaller, lower panel allowing access to the stop valve. For more information and a free quotation please contact our sales team on (01246) 472758 or fill in the contact form contact page. 2.) Brand name of the tank & dimensions. 3.) Inform us of the access. 4.) If the tank is sited on a plinth or hard standing paving (include these dimensions). 5.) Is a'watchman' or aerial fitted? 6.) Photos or a drawing to show the access, tank and the position of the acces value & hatch. 7.) We can then inform you of the price by email or by phone. We will then forward a CAD drawing so that you can confirm the dimensions are correct. We will issue an invoice. Your contact details including contact phone number & email address. The delivery & invoice address.Securit GB Ltd will phone you a few days prior to delivery to confirm you are able to accept delivery. Cheque, credit/debit card or COD. As all our tank Guards are 'bespoke' and designed to your specific requirements, we require a 20% non refundable deposit before we manufacture the goods with the remaining balance paid on or before delivery. There is a1.5% surcharge for paying by credit cards (Master Card & Visa), no charge for debit card, cheque or BACS payment.